My philosophy on teaching is that if kids can’t learn the way we teach, we must teach them the way they learn. 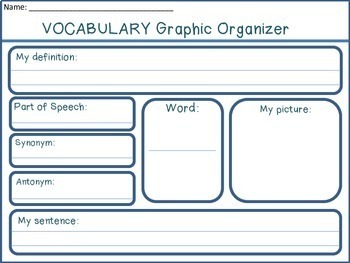 I use this set of Vocabulary Graphic Organizers for teaching terms, expressions, reading comprehension, analogies, and grammar. 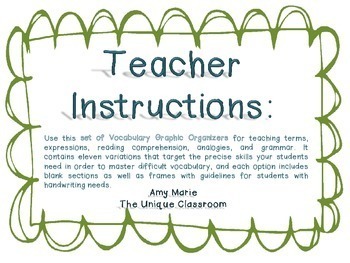 It contains eleven variations that target the precise skills your students need in order to master difficult vocabulary, and each option includes blank sections as well as frames with guidelines for students with handwriting needs. 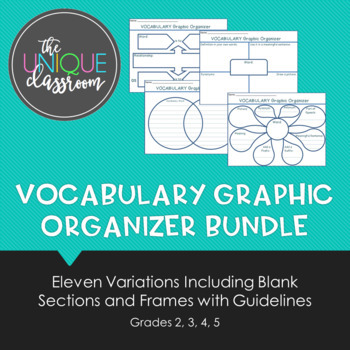 It's a great visual tool for students to grasp challenging vocabulary words, and can even be used as formative and summative assessments. 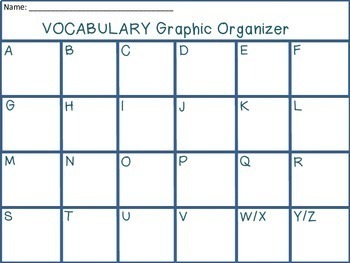 Each organizer is free of busy distractions, like clip art and hard-to-read fonts. Special needs students are not the only ones who benefit from a clutter-free paper!